MIDDLETOWN—Darcie Sirota, 18, was looking at a $375 La Femme prom dress before her father stumbled across a fundraiser online—a prom dress and suit sale that sold discounted formal wear to benefit charity. Sirota, along with her mother, went to check out the April 3 event at Sinai Temple in Middletown and for a $10 donation walked away with an almost identical dress to the one she was going to buy. “We just got the college tuition notification,” said her mother, who paid for her dress and said she was happy with her daughter’s choice. The idea, while not original, was the brainchild of Middletown resident Josephine Bloomfield who went to stores, put out posters, and through social media collected formal wear donations to make prom night affordable for teens. The proceeds from the event went to the Middletown warming station at St. Paul’s United Methodist Church. I’m the type that if I go to a party and wear a dress, I only want to wear it once. 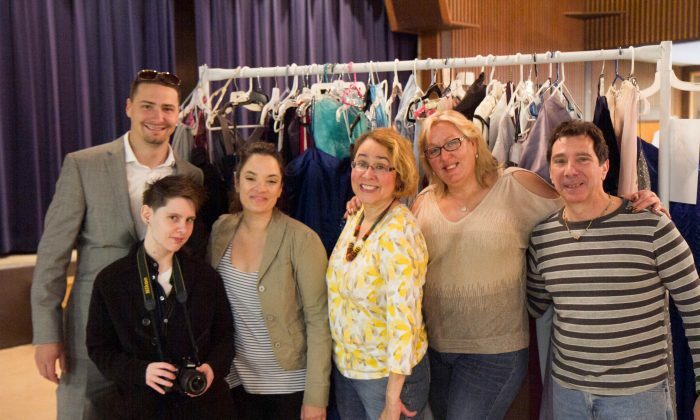 She and other volunteers collected about 210 new or lightly used dresses, 24 suits, and dozens of ties, shoes, jewelry and more. About 35 people came to the April 3 event, and some walked away with more than one outfit, said the Temple’s Executive Director, Lisa Miller. While it was billed as a prom night event, she said anyone who needed formal clothes was welcome. Bloomfield enlisted Middletown barber Mitch Turner, hair dresser and co-owner of Transformations Salon Stephen Sturman, and makeup artist Claudette Clausen to give the event an added dimension. They said for them it was about giving back to the community and all the donations from their services went to the warming station. All the services and apparel came with a suggested donation, but Miller said if someone couldn’t afford something, she would give it to them for free. They will be hosting another event at Temple Sinai on Thursday, April 7 from 5:00 p.m.–6:00 p.m. If there are clothes or items left over, they may donate them to similar charity functions, give them to schools, or hold a fashion show with them.